With the impending arrival of the Apple Watch, it's time to start looking for some new bluetooth headphones/earbuds. ❝The big question is whether it's worth all the trouble. Having to charge another battery pretty much every day, being surprised by "bad wireless" days, the poor audio quality in HSP mode, the video-killing lag, and the extra cost all scream "No!" As per the reasons above, when the MM450 broke I wanted to get another set of bluetooth headphones, but although I liked the MM450, I didn't like the price and durability. So I got the much cheaper FSL Zero instead. The FSL Zero are great for indoors, but the size and sweaty ears issue make it a non-starter for use outside when it's warm or when exercising. Enter the Jaybird Bluebuds X bluetooth earbuds ($140 at Amazon). Yes, they're a little bigger than most earbuds, but only a little. They weigh 13 grams. That's half of what a typical AA battery weighs. But the battery life is 8 hours. I don't know how they did it, but the iPhone shows a very tiny battery indicator for the Bluebuds next to the bluetooth icon. Another nice touch is that there's a voice that tells you the battery is running low, as well as telling you when the earbuds are turned on, connected using bluetooth or in pairing mode. Pairing was super simple. There's a red/green LED, but it stays off during normal use. The Bluebuds come with a carrying case and a short USB-to-micro-USB cable, but no charger. With regular earbuds, I always use the smallest tips because apparently I have small ears. On the Bluebuds these are a bit bigger than normal (and not interchangeable with ones from my wired earbuds) but they still fit—and didn't fall out over the course of several hours' use. Like Apple's Earpods or the Sony DREX12IPB that I normally use, the Bluebuds have three buttons: volume up, volume down and play/pause. With wired headphones/earbuds you skip ahead by double pressing the play/pause button and back with a triple press. On the Bluebuds this is accomplished with a long press on the + and - buttons. A long press on the play/pause wakes up Siri and a really long press turns off the Bluebuds. The volume buttons do the exact same thing as the volume buttons on the iPhone itself, which is good. Audio quality is very good for podcasts: voices sound natural. As with most earbuds, there is less bass and more high end, but there's still a reasonable amount of bass and the high frequencies aren't harsh. Obviously you wouldn't want to use these to do serious music listening, but the Bluebuds certainly aren't terrible for music. You can even use them when watching video, there isn't any noticeable lag. 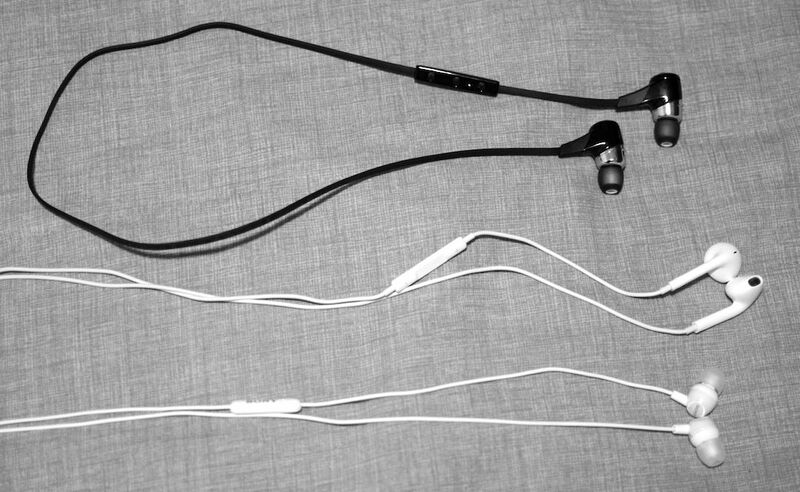 You wear them either using the "traditional under-ear fit option" where the wire between the earbuds runs down your cheek and the controls are on the right, or with the wire running up and then behind the back of your head, with the controls on the left. Unfortunately, there's no option to reverse the left and right channels. Jaybird claims the wireless reception is good enough to leave your phone in your gym bag when you work out, or wear it anywhere on your body. Looks like they're not exaggerating: I had barely any dropouts out in the open, where my old MM450s would always struggle. Walking into the kitchen is also entirely doable. I'm impressed with the Bluebuds. Without any wires or over-ear foam pads but with better than average bluetooth reception, they allow for lots of situations and activities where other types of headphones or earbuds just don't cut it. 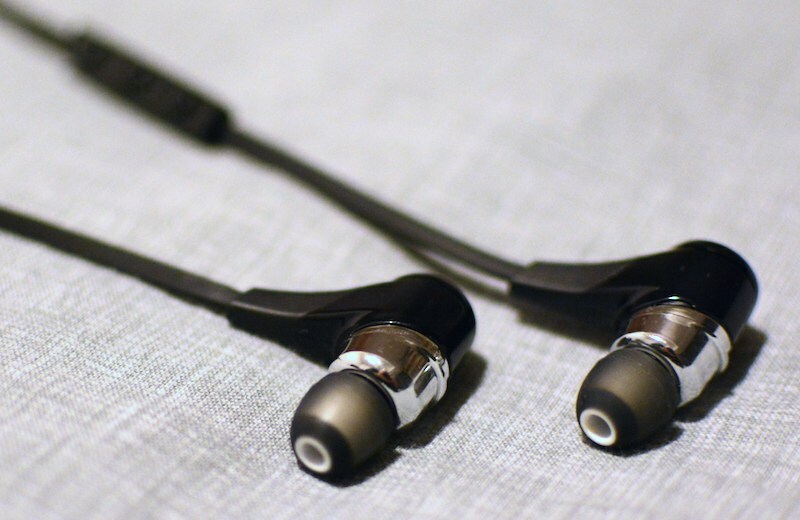 However, only get them if you can wear in-ear earbuds comfortably, as they are a bit bigger than the wired variety.